i131 New Hampshire is a specialized veterinary service at the Capital Area Veterinary Emergency & Specialists (VCA-CAVES) in Concord, New Hampshire, which is dedicated exclusively to the care and treatment of feline hyperthyroidism using radioactive iodine injection (i131), the only cure for the disease. 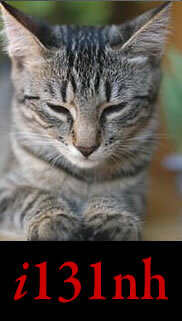 Many older cats develop a thyroid disease where too much thyroid hormone is produced. This elevated hormone causes your cat’s metabolism to run too high, causing weight loss, heart disease and kidney disease. Other signs can include hyperactivity or lethargy, appetite changes, increased drinking, behavioral changes, and/or diarrhea. Left untreated, hyperthyroidism is fatal. Guinea Pigs develop hyperthyroidism and can be treated with i-131. Click here to find out more about the disease and treatment. Capital Area Veterinary Emergency Service (CAVES) VCA – CAVES is the only I-131 treatment center in central New Hampshire where your cat is monitored daily by a Board Certified Practitioners. We also offer a unique webcam service in which you may "visit" your pet as often as you want by viewing our streaming webcam on your computer.